As 4k Ultra HD monitors are more and more common nowadays, HelpNDoc's user interface can now automatically scale to look great on any screen size, resolution and scale settings. HelpNDoc is now a DPI-aware Windows application, meaning that its user interface has been fully updated to scale seamlessly for any screen resolution and scale settings. All icons have been converted to vector graphics so that they look smooth at any size. User interface elements have also been enhanced to correctly scale based on current screen's display settings. HelpNDoc includes a very powerful script editor, able to automate almost any part of your documentation process. This update enhances the script editor and includes new scripts. In the script editor, you can now use the "Load script" drop down menu to rapidly load any system or user script. Hit F9 to build and run the script. Done! 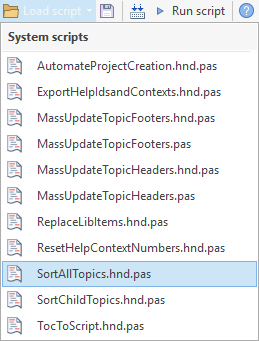 This update includes much requested scripts to sort all topics or children topics by title, as well as the full script to reset all topics' context numbers incrementally. It is now possible to control which tab is shown by default when launching your HTML documentation: add "?tab=index" to the URL to show the Index tab and "?tab=search" to show the Search tab. It is also possible to redirect your visitor to a specific search term by adding "?search=term" to the URL. The HTML template has also been enhanced. It will now display a useful error message when the web server is badly configured and does not correctly return JSON files. Keywords are now correctly written in topics' HTML files and the default topic icon has been fixed amongst other enhancements and fixes. This update can now automatically include unknown files as text files, it better handles keyboard shortcuts and includes many other additions and bug fixes as detailed in the change log below.